The SU inherits all the very best of Mitsubishi’s proprietary technologies which have been developed for over half a century. Mitsubishi’s reliable mechanism generates a powerful propulsion, yet compact style makes the engine easy to mount and maintain. Robust, rigid structure and low fuel consumption ratio — key requirements for the main engine of tugboats and other heavy applications. 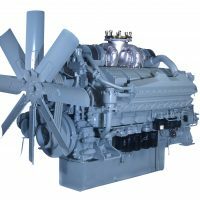 The SU engine is built to deliver reliable service for many years and to satisfy the exacting demands of professional boat operators. An intermediate shelf is provided in the cylinder head to enhance rigidity and efficiently cool the combustion area. The exhaust valve is made of heat-resistant alloys and its seat area is reinforced cobalt based heat-resistant alloy to prevent high temperature corrosion and wear. Tufftlide treatment is applied to the cylinder liners for excellent wear resistance. The piston comprises a high strength, heat-resistant steel crown and a high strength, tough forged aluminum body. The durability of the piston at high outputs has been improved by the use of a forced cooling system.The constant temperature cooling system with thermostat gives optimum combustion. 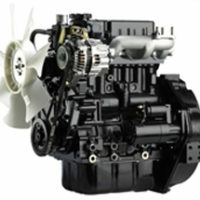 Fuel consumption at rated output is around 200 g/kWhr. The high-pressure injection pump together with optimum cam profiles and injection nozzles realizes high-pressure injection of 1500 kgf/cm2 and reduces the injection period to further increase combustion efficiency. NOx emissions and smoke have been reduced by improving the integration between the piston combustion chamber shape, compression ratio and fuel injection timing. All maintenance and servicing of the equipment, including the fuel injection system, is located on one side while the exhaust and cooling water pipings are installed on the other for easier access. The main bearing and cylinder head can be tightened easily and securely using an hydraulic device. A large inspection area is provided to enable assembly and disassembly of the piston and main bearing inboard. The major component parts are light enough and split into smaller components for easier handling. Be the first to review “MARINE SU RANGE” Click here to cancel reply.